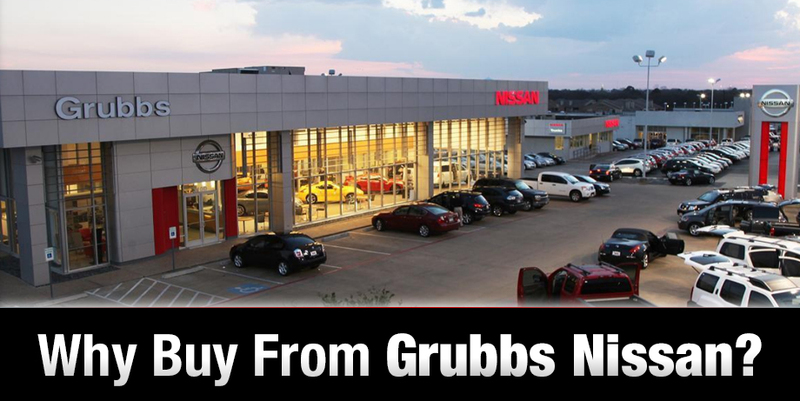 If you're a Texas driver looking for a new car near the Metroplex, turn to Grubbs Nissan. Our Nissan dealership in Bedford, TX, has been serving drivers who demand the best for more than 60 years, and we're confident we can make you our next satisfied customer. Whether you're on the hunt for an exciting new Nissan car or SUV, want to purchase a Certified Pre-Owned Nissan truck or simply need service for the Nissan you already own, Grubbs Nissan is here for you. Our family-owned Nissan dealership near Arlington and Dallas prides itself on our massive selection and our customer-first atmosphere. We're committed to , and have contributed to a number of great causes throughout the years. Many members of our sales, parts, finance and service teams have been with Grubbs Nissan for many years, meaning you'll come to trust the same friendly faces again and again. And rest assured that our staff is comfortable conversing with you in your native language We speak Spanish, French, Vietnamese and more! Looking for more reasons to buy from Grubbs Nissan? We have more than 1,000 new and used vehicles available. You won't find a more impressive selection of Nissan models than what we offer. We're a KBB Buying Center, which means we can purchase your trade-in whether you buy from us or not! Thanks to our on-site Allstate Insurance office it's easy for you to get high-quality, affordable insurance for the vehicle you buy or lease from us. It's easy to get fast, efficient service at our dealership. Use our Express Service for routine maintenance to ensure your Nissan runs at its best without disrupting your routine. You can enjoy free Wi-Fi, fresh-made coffee and snacks as you wait in our comfortable customer lounge, because we want you to feel right at home. Check out our amenities. It's easy to get to our dealership at 310 Airport Freeway in Bedford, TX. We're just 30 Minutes from Anywhere in the Metroplex!